Although you’ll most commonly hear me waxing lyrical about OS X these days, I’m a long-time Linux user. I’ve been running various flavours of Linux at home since Redhat 5.0 days. Why Redhat and Fedora? Well, a good friend of mine noted a long time ago that it was the distribution likely to get the blessing of enterprise vendors as time went on. I’m not here to invite a flame war, and I’ve been impressed with a lot of other distros over the past couple of years in particular (while I keep meaning to give Ubuntu a “proper” run, I use it for development in VMWare Fusion on the Mac). I’ve run Fedora on a server and a workstation at home for a while now, and I’m always pretty keen to see what a new version has to offer. Enter Fedora 9. I use my MacBook Pro pretty exclusively these days, so I just wanted a quick and easy way to see what Fedora 9 was like. I considered the Fusion option, but then read about the “Live USB” option. This is really nice… there’s a (currently Windows-based, sadly) desktop app that you run to select the “spin” of Fedora that you want, point it at an inserted USB memory key, and away you go… I chose Fedora 9 and let the Thinkpad download the image and then install it on my 1Gb USB stick. I also asked for a 200Mb “persistent overlay”, i.e. space that I could use for persistent storage of data like (I assume) my home directory. This is a far nicer option than a Live CD, as I can take my data with me. A quick reboot, choosing a temporary boot device, pointing at the USB stick. The boot process was not all that promising, as it initially reported what looked like errors about inability to assign USB identifiers (or something), but it did all boot fine. In fact, it booted more than fine. I was pleased to find that Fedora 9 picked the “right” (i.e. max) resolution for my display straight away. The only customisation I needed to do to make the desktop more pleasant was to reduce the font size, but I can see why they went with the default size that they chose. The next thing was to get myself online, or at least onto my home network. Based on past experience I went into the Network config under system preferences and started fiddling with the NIC settings. Didn’t work – although it could see the wireless card it didn’t want to let me join the network. Then I spotted the little wireless icon in the system tray at the top right of the screen, and clicking there let me join my home network immediately – with OS X levels of ease. Very impressive stuff. Sound worked straight out of the box too… if I come across as surprised, remember I’ve been using Linux since RH 5 and I’m well aware of how flaky much of this stuff has been over the years. 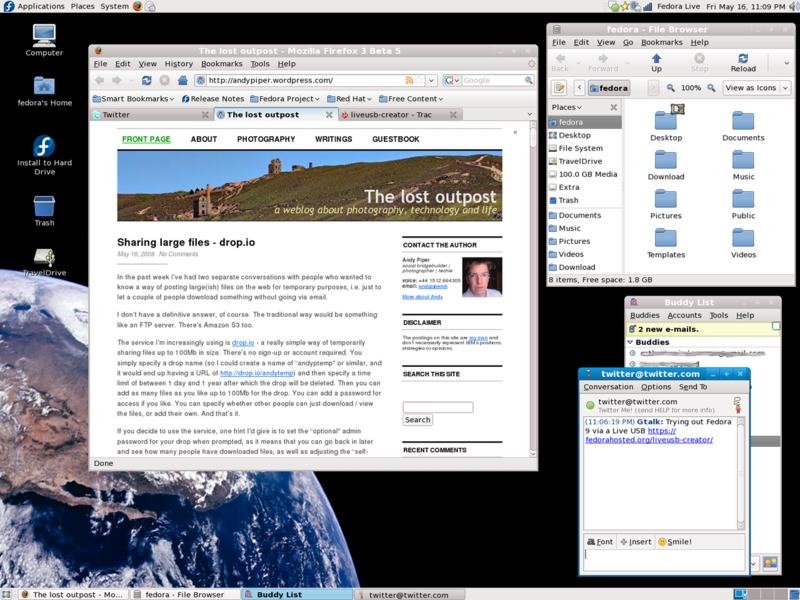 Firefox worked fine, Pidgin let me configure my Google Talk account within seconds, taking a screenshot and editing in Gimp was no problem… this was a lovely experience overall. I was even able to install the Flash plugin for Firefox (although I had to download and install the RPM via sudo, rather than it just working via the Firefox addons installer). All-in-all I was extremely impressed with the ease-of-installation and use. I’m not sure how often I’ll want to use this, but the fact that I have a fully-usable Linux distro on a bootable stick is just brilliant. This entry was posted in 24924 and tagged Fedora, Fedora 9, Linux, Redhat, USB. Bookmark the permalink. I knew that coment would be a rat-hole. That was a statement about life 8 years ago, not necessarily today. RHEL is clearly something that is being used in the enterprise, RPM as a packaging format is common, so I’m glad I “grew up on” RH and Fedora, but I want to make clear that I was making a point-in-time statement about why I started out on that distro, and not saying that the situation is the same today. Ubuntu has no standing on the enterprise. Look at their release which ships a beta version of Firefox for supposedly their “enterprise” product. Where is the list of third party certified apps? Nobody buys a commerical enterprise product for the OS itself. It is the certified hardware and software that counts. Canonical has no upstream contributions worth talking about either. They just package software developed by others like Red Hat. Unlike Fedora, Ubuntu relies on proprietary technology like launchpad and landscape. Most of Canonical employees spend their time on distribution specific technology which also is proprietary and Ubuntu is run as a hobby by a wealthy guy and hasn’t even made itself profitable yet. What happens when the money runs dry? OK I really don’t want this post to be a Ubuntu vs Fedora thing. I made a throwaway remark about why I started using Redhat in c. 1998. That’s all. I bricked my laptop upgrading from F8 to F9. No problem: I opened up Luke Macken’s excellent Fedora USB creator for Windows on my mother-in-law’s computer, created a USB stick with a single click and about an hour’s wait, and presto! I’m using it on a couple of other computers while I’m figuring out what happened with my upgrade. I’ve been looking for a distro to stick on a 1GB USB stick for ages… one that would just *do* everything I needed. The fact that this might just be possible now seems almost a pipe dream, but I may well just d/l it and see what happens. The more I go to client sites, the more I want a little piece of linux to go with me. Oh and I completely agree how linux distros like this are generally stable for most things except sound and networking. If this manages to do it so simply, then I’ll be very impressed. Andy, even though you needed a machine running Windows to create / configure the USB stick, can you plug it in and get it working on your MacBook? Hi mediamgl, I’m afraid you can’t boot a MacBook Pro from one of these USB sticks (just tried it) – I think the partition type is wrong for the BIOS to recognise it. You could boot a VMWare virtual machine off it, I guess. The fact that this might just be possible now seems almost a pipe dream, but I may well just d/l it and see what happens.